Our lounge bean bags take the idea of bean bags to a whole new plane. For us, that means a world of carefully crafted, modern designs that not only blend nicely with all your other furniture, but feel just as comfortable to sit in. They are designed to enhance the look of your lounge room with striking contemporary colours and shapes. We have designed our bean bags by incorporating observations about how furniture is used to ensure weight distribution, back support and overall functionality remains supportive. You can choose from single chair designs including the Bliss Chair or Single Sofa lounger, to the Two Seater Lounger or the two seater sofa. The sofa range has sharper edges with an addition of piping for a striking look. 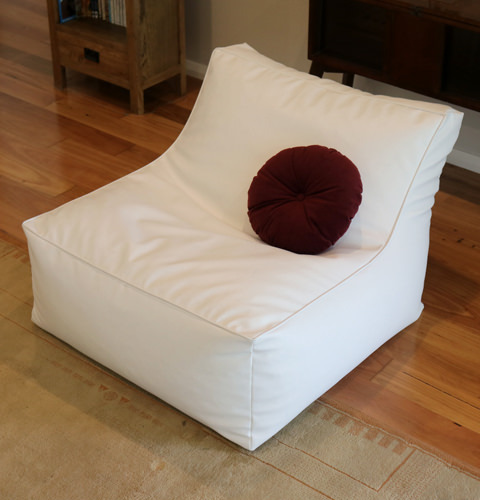 The greatest benefit though is the sheer flexibility of choosing bean bag furniture and what it means for your lifestyle. Frequent house moves are no longer a burden if the lounge can be packed down and moved with ease by one person. You can even pack them right down without the beans when moving big distances – then just purchase the new beans inexpensively at your new destination. And with a lifetime warranty, whether you have a nomadic lifestyle or not, they will stay looking good no matter where you call home.